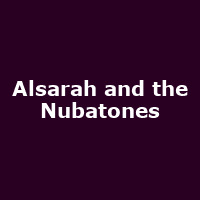 "Alsarah and the Nubatones came together out of a collective love for Nubian music and a genuine belief that Soul transcends all cultural and linguistic barriers. Inspired by the pentatonic scale they blend a selection of Nubian 'songs of return' from the 1970s-today with original material and traditional music of central Sudan. Their set is a musical journey through diaspora and migration from an urban lens."